Come on, get happy! Grid's hosting a movie night! Has the post-holiday, back-to-work grind given you the blues? Join us on Thursday night from 5:30 to 7:30 at the Trinity Memorial Church (22nd and Spruce) for a dose of cheer. 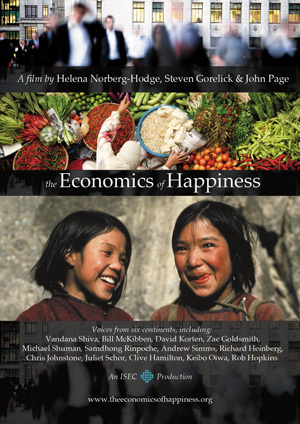 We're sponsoring, in conjunction with Sustainable 19103 and the Office of Sustainability, a screening (just an excerpt), followed by discussion, of The Economics of Happiness. The film features some of our big heroes -- Vandana Shiva, Bill McKibben, Michael Shuman -- discussing the benefits of localization and the perils of globalization. Light appetizers & beer provided, BYO wine. Cost is $5, and you can buy tickets here.